Will My Cat Hate Me If I Take It to the Vet? If the thought of wrangling your cat to get them to their vet appointment makes you cringe- you’re not alone. Who doesn’t enjoy peeling their cat out from under the bed, somehow coercing them into the carrier, and then driving them to the vet office? All while they yowl obscenities at you. This can be a highly stressful event, not only for your cat, but for you as well. Oh yeah, and the experience at the cat’s clinic hasn’t even begun yet. It is no wonder, according to the AVMA, nearly 45% of cat owners do not consistently bring their feline in for routine wellness exams. Partly due to cats being “too hard to transport”. You will never actually know what your cat is truly thinking, but when it comes to cat behavior and how they feel about us as owners, there are two schools of thought. A recent study out of the UK by Daniel Mills, states simply- Your cat doesn’t like you. He says that cats appear to have an "anxious avoidant" attachment style. This means that they do not care whether their owners are present or not. They will be stressed and uncomfortable whether their owners are close by or not. They will not see you as a source of emotional stability or as a soothing presence in their lives. So it shouldn’t be surprising that a cat owner would be concerned that their feline companion may harbor a grudge after returning home from the vet. With a little preparation, you can minimize the stress for your cat, and ultimately for yourself as well. We truly believe that no cat should go without healthcare, simply because of fear and anxiety. Making sure that cats are used to going into their carrier and that the carrier is clean and cozy is very important. We recommend leaving the carrier out at all times if possible so cats see it as a valuable resting place. This will ease the process of transport. Providing a soft clean blanket or towel in the carrier also makes the trip more enjoyable. It may also help to place some catnip or yummy treats inside. The best place for the carrier to be is on the floor behind the passenger seat, as this will provide the most security and least amount of visual stimuli to the cat. You may also cover the entire carrier with a large towel to make the cat feel more hidden. We strive to move feline patients into our cat only exam room immediately to avoid any interactions with other patients. We do not recommend placing the carrier on the ground for any reason. Cats naturally enjoy being up high and feel more secure if they are off the floor. Ideally, we like the cat to come out of the carrier on their own, instead of being pulled out. If the lid can be removed, this will aid in moving the cat but the examination may also be done in the carrier with the lid off. We try to allow cats to venture out of their carrier on their own terms. Some routine things can even be done right inside of their carrier. The least amount of handling is utilized by our staff. Most cats do not need to be “scruffed” (grabbing the cat by the loose skin around their neck) during exam or treatments. We regularly use large clean towels to assist in covering the cat and manipulating them if needed. 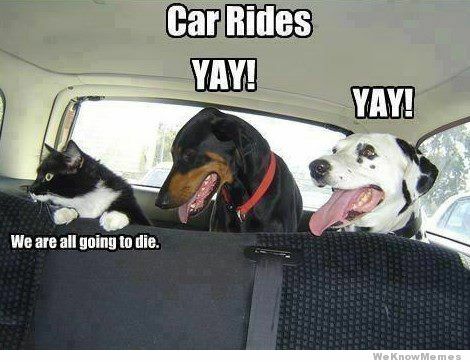 We know that cats are not "being mean" but are just reacting out of fear. Our goal is to minimize these fears and make the visit enjoyable and as fear-free as possible. In cases where a cat is extremely anxious and hard to handle, we can offer an oral sedative that is given at home a few hours prior to the appointment to help calm the cat and allow for a better examination to be performed.